We are looking for a Junior Scientist! News > We are looking for a Junior Scientist! 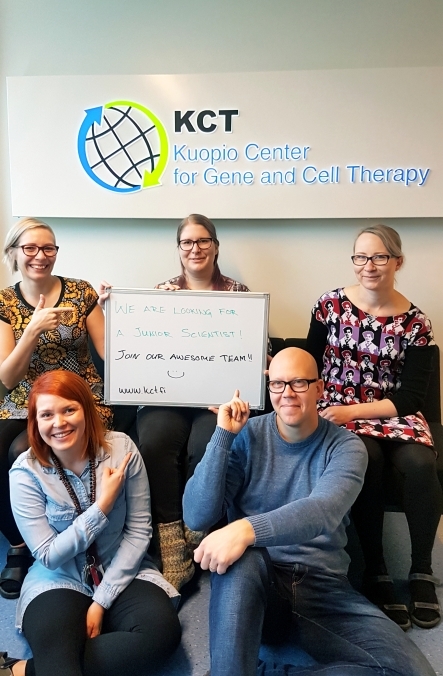 Kuopio Center for Gene and Cell Therapy (KCT) is looking for a Junior Scientist for upstream (US) and downstream (DS) process development team. KCT DS process development is focusing to improve the platforms and methods to concentrate and purify viral vectors. Typically Adeno-, Lenti- and AAV-viral vectors are produced in small lab scale bioreactors or in Pilot area for scale-up. Purification processes are performed typically in clarification filtration, Tangential flow filtration and in chromatography steps. Junior Scientist would be responsible for taking care of the laboratory basic functions and to participate in DS process development with the team. The job requires know how on US and DS techniques such as bioreactors, TFF and chromo and the ability to operate equipment independently after adequate training. Suitable candidate has either an University degree or has obtained the needed skills through several years of work experience. Previous experience working with different filtration, TFF and chromatography systems is seen as an advantage. Analytical and upstream process development experience should also be useful. The nature of process development requires ability to cope with changing situations and a mindset willing to face and overcome challenges. In addition to challenges we offer modern facilities, inspiring atmosphere and skillful team with good motivation. Our goal is to develop GMP ready processes for the future. Would you like to be part of it? Kindly send your cover letter and CV including your salary request to jobs@kct.fi by Oct 7th 2018. Additional information on the job is given by Laboratory Manager Joonas Malinen tel. : +358456384809 and Gene Therapy Director Hanna Lesch tel. : +358505434900 on Fri Sep 28th and Fri Oct 5th at 13:00-14:00.